Search our Blowing Rock properties to find available Blowing Rock cabins for sale. The Mountain Group at Premier Sotheby’s International Realty is the premier realty company operating in the Village of Blowing Rock. Our agents are prepared to work tirelessly to help you find your dream cabin in the High Country in Blowing Rock. Cabins are not all created equal. 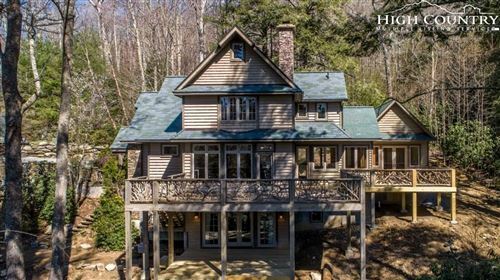 There are historic, log cabins that date back a century that are still standing on tracts of Blowing Rock large acreage, and there are new constructions listed for sale that were built using a pre-selected or customized log cabin kit. There are even a few Blowing Rock cabin developments currently being created. We represent all types of sellers and you’ll find all different kinds of Blowing Rock cabins for sale on the Watauga County MLS (multiple listing service). We’d love to help you select your dream home in the mountains. Blowing Rock log cabins are a preferred type of home because they are warm and cozy. Centuries ago they were the only type of structure that could be built efficiently, and survive the harsh weather and conditions in the Blue Ridge Mountains. Log home construction is something of an art form, as it includes many steps that have to take place at precise points in time and construction. Some homes are also built on a timber frame utilizing different materials and a different building process. We would be happy to answer your questions and help you select your dream home from the available Blowing Rock Cabins for Sale. Our Blowing Rock realtors and agents have a wealth of experience in working in the High Country. Our team hails from around the country and many have sold real estate internationally. We would love the opportunity to introduce our team, meet with you, and find out your personal wish list.